With the invasion of Korean culture in the Philippines, it's no wonder that their beauty regimen has gained popularity here. 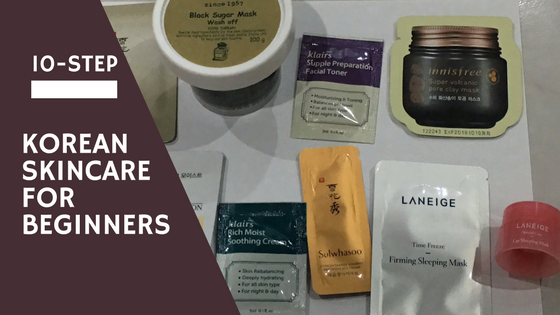 Although I'm leaning towards "less is more" type of skin care routine, I decided to give it a try using mostly sample versions of some of the popular brands. This way, my pocket won't bleed in case it doesn't work on my dry skin. If you're a busy person like me, this regimen entails a lot of patience since it really takes time. If you don't have more than an hour to spend on your skin care routine, then this one is not for you. This is the first step of what they called "double cleansing" is to remove all the makeup on your face. I usually use Garnier Micellar water. However, I also have the following brands that I still need to try. I've heard a lot of good reviews on Banila Co. Clean It Zero and KLAIRS Gentle Black Deep Cleansing Oil. This step removes any excess dirt and other residue that was missed during the first step of cleansing. I'm regularly using iWhite Korea's Whitening Vita Facial Wash. 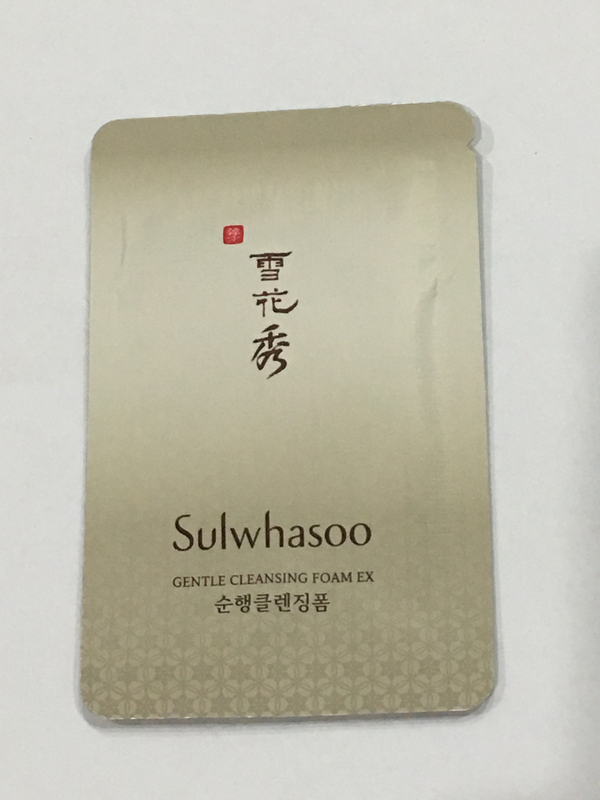 I tried Sulwhasoo Gentle Cleansing Foam Ex and I liked it because it's gentle on my skin. I also have Cosrx Low Ph Good Morning Gel Cleanser that I'm excited to try out. I try to make time and exfoliate 2 times per week but mostly, I only get to do it once per week. This step is very important because it scrubs off the dead skin cells. I'm currently loving my Skinfood Black Sugar Mask Wash Off and it smells so good. I have sample sizes that I still haven't tried yet for NEOGEN Bio-Peel Gauze Peeling Wine and NEOGEN Bio-Peel Gauze Peeling Lemon. I also use a treatment mask as an additional but optional step. I used clay-based masks which tend to be drying on the skin so I only used it once per week or once every two weeks depending on my skin condition. I tried Innisfree Super Volcanic Pore Clay Mask. Toners are supposed to balance the pH levels of our skin. It basically helps prepare our skin to fully absorb the products that we put on our face on the succeeding steps of our skin care routine. Most of the Western toners are alcohol based. What I like about Korean toners is that they're very gentle on the skin and doesn't sting like most toners. 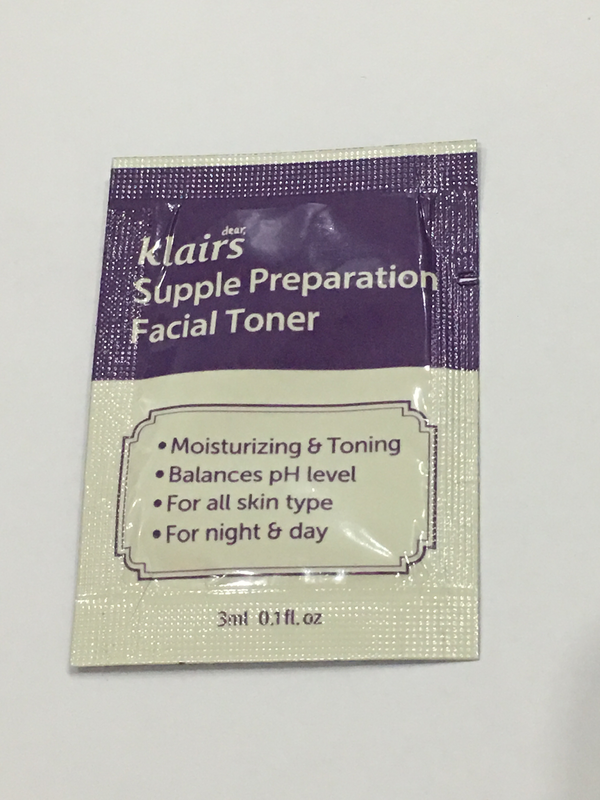 I used KLAIRS Supple Preparation Facial Toner and it is amazing. I only tried their sample size but I'm planning to buy more. I have also tried Son & Park Korean Beauty Water and again, hands down to this product since it also worked wonders on my skin. I've always read online that Korean's consider this step as the most essential part of their daily skin care routine. An essence, serum, or ampoule is used to hydrate and improve our skin quality. I tried Misha Time Revolution The First Treatment Essence and it's impressive. People often said that this is a dupe for SK II. This is a product to address any specific skin issues that you have whether it's acne, wrinkles, skin discoloration, etc. In my case, I used Missha Time Revolution Night Repair Science Activator Ampoule. This is the easiest and most relaxing part for me. If the Essence is the heart of Korean skin regimen, then facial masks are considered the soul of K Beauty skin care routine. There are a variety of brands to choose from and so far, I'm loving all the brands I have tried. Also, facial masks are really affordable for as low as 15 pesos each depending on the brand. I love Innisfree It’s Real Squeeze Sheet Masks and Etude House 0.2 Therapy Air Mask. I have a lot of other different brands that I'm excited to try such as Tony Moly I’m Real Sheet Masks. If you have eye bags and dark under eyes like me, then you should not skip this part. Eye creams protect and hydrates our skin. Some people skip this part but for me, it's a must! I have used a lot of different eye creams such Sulwhasoo Concentrated Ginseng Renewing Eye Cream and Quick FX Eyelift Cream. I love this part since I have dry skin. Hydrating my skin has always been one of my top priorities to achieve that glowing, dewy skin. I love iWhite Korea's Whitening Vita Aqua Moisturizer Cream and I have also tried KLAIRS Rich Moist Soothing Cream. I work night shift so I don't use a product specifically for SPF and ironically, I use a night cream during the day when I sleep. I love Laneige Water Sleeping Mask and Laneige Time Freeze Firming Sleeping Mask. I love putting my facial masks in the refrigerator a few minutes before using it. Gives me that extra cooling effect. I just started this Korean skin care routine last April and I must say my skin has improve a lot. It kinda became a routine (or addiction I should say). The sheet mask I use it when Im lazy to go through all the routine. I use the Innisfree volcanic clay mask and I must say it helps with m pores. and also its so perfect for our topical country because of its cooling effect. I can say Korean products are worth it because it effective, not harsh and long lasting. My Missha Time Revolution Essence is still above half of its bottle while Im almost done with my 2nd bottles of Celeteque toner and moisturizer. By the way, I wanna ask where did you got your samples? I wanna try Klair products. I am also using the 10-steps and its amazing! Whenever I travel, i only bring my trial packs and sachet form skincare for less hazzle. This is what I like about Korean products as well since they have sample sizes that are readily available. I remember my sister's Korean skin care routine, grabe, ang mahal ng ritwal! She's in Qatar now but when she was still staying with us, I got a chance to try her routine and I love it! I love the idea of using samples! So clever! I have tried this routine but got lazy after few days because it needs a lot of work. Aside from the basic steps, I keep applying essence and masks as often as possible. I totally agree! I usually skip some steps on lazy days but make it a point to religiously cleanse, tone, and moisturize. I don't know if I'll ever have the courage to do this, I'm talking about the possible costs of all of these products, lol! But I've learned about Korean skin care from previous blogs already and it really seems nice. I've been away for far too long. I have not idea what's in and what's not in the Philippines. So anything Korean seems to be the in thing, not only dramas but alao beauty products. I'm thinking of trying out Korean Skincare but I prefer a three-five routine rather than 10.